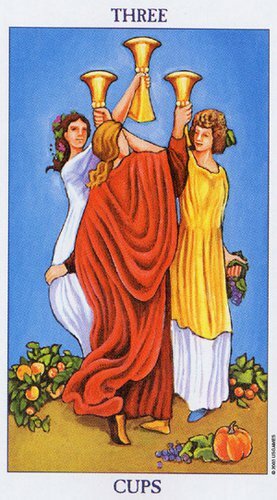 This is a truly beautiful card, one that depicts 3 women dancing in a circle in a celebratory manner, each raising a toast to the sky. The sky is bright and blue, no sign of clouds or rain. At their feet lie the fruit of their labour, an abundance of harvest. In Norse mythology we find reference to the three creatures of time, they who determine fate. Called the Norns, they were known as Urd, Skuld and Verdandi, respectively the past, present and future. Before they came to Asgard time did not exist, therefore they were considered above even the gods, as fate could not be determined without time. The Norns would visit each being, humans as well as gods immediately after they were born to determine their future. Just like the Fates in Greek mythology, these three creatures determined how long every individual would live. The Greek Fates were called Clotho (the spinner,) Lachesis (the drawer of Fates,) and Atropos (the inevitable.) Clotho would spin out the newborn’s thread of life, Lachesis measured it and decided what was going to happen to this being, and Atropos cut the thread. They were often depicted around a spinning wheel or a cauldron. The past, the present and the future. Whom amongst us has not at times wished that we could go back into the past to change something, or that we could travel to the future to gain knowledge as yet unknown to us. It is usually as we mature that we realize we have no business in either the past or future, as all we have and are is in the present. The power of Now. Why is it that Guru’s and psychologists say the same thing, namely the importance of living in the present? Could it be that they know something we are still learning? Living in the ‘now’ is called mindfulness. It is at the root of Buddhism, Taoism and yoga. Mindful people are happier people, they are more exuberant, more secure and more empathetic. The health benefits of living in a state of mindfulness includes reduced stress and blood pressure, it boosts the immune system and reduces chronic pain. Everyone agrees that it is important to live in the moment, but how do we do this because when we are not in the moment we are not there to know we are not there… Overriding the distraction reflex and awakening to the present takes practice and intention. Living in the moment contains a profound paradox, we cannot live in the moment in anticipation of future benefits, because that launches us out of the moment and into the future, which subverts the entire process. It requires us to trust that the rewards will come. Living in the moment has the added benefit therefore of helping us place a healthier perspective on the events of our lives, and in a sense helps us to ‘tie-up’ many loose ends that we may otherwise leave dangling to trip over. The celebration that we see in the 3 of Cups could very well be ours as we bring into alignment our own past, present and futures. Trust is very much a ‘feeling’ thing, therefore the suit of Cups from which this card comes perfectly reflects to us that we are required to feel our way into mindfulness rather than through analysis and expectation. Our thoughts may come and go, thoughts of the past and future. A simple acknowledgement is all that is required as we maintain the state of mindfulness without allowing the distractions to derail our process. Interesting take on this card, I like your idea of a personification of 'living in the moment'. It often seems to me that we should deal with others in this way (as the card often refers to the loving interactions with others). When we deal with even our closest companions, sometimes it seems that our interactions are filtered through both the past (hurts & griefs, or past joys) and the future (hopes). If we could be with them in the very moment, as they are and as we are, with all of its blessings, how much clearer could our relationships be!